As more and more hype in the press comes out about what you can do on the Internet, less and less are people understanding what the Internet is. This isn't an entirely bad thing since it indicates that less and less technical expertise is required to actually use the Internet. But if you don't understand some simple concepts about what the Internet is - and isn't - you won't be able to determine the placement - or measure the value of the Internet - in regards to an overall marketing strategy for your business or organization. Simply put, when you connect one office network of computers - often called a Local Area Network (LAN) to another LAN or office computer network, you can basically refer to the two networks as being Inter-networked together. Hence the term Internet. Refining this a little more, what makes the Internet such an amazing phenomenon is that the Internet isn't comprised of just one or two networks of office computers able to share data back and forth; the Internet is comprised of thousands and thousands of networks of computers, with each network having any number of computers attached to it from 5 to 50,000. Ok, Many Computers Networked Together. The next question many people ask is "How is that going to help me?" We say: Plenty! Once the exclusive domain of military researchers and academicians, the Internet has exploded in size - largely due to the emergence of tools like the World Wide Web, a software protocol layer that allows easy access to data available on the Internet. The growth of the Internet is averaging 20% per quarter! And the newer users of computers attached to the Internet - while still reflecting some traditional demographics - are less technology centered but more consumer centered. Companies recognizing this already now place not only marketing and public relations information on the Internet to promote consumer awareness of their products, but are increasingly offering products and services for sale directly to the consumer via the Internet. This commercialization of the Internet is feeding on itself - as more people flock to the Internet to find information about products, goods, services, and traditional data for research purposes - more and more companies and organizations are making this data available on the Internet. Available 24 Hours A Day, Seven Days A Week. The Internet is open for business around the clock. You can make text, photos, graphics and charts, drawings, schedules, books, magazines and catalogs, even audio and video clips available to millions of people using the Internet day in and day out. Because the data is maintained on computers, it's generally simple to update and keep the information current - much more so than with print media. You don't have nearly the lead times required to update information on the Internet as you do when going to press; and publishing on the Internet is a fraction of the costs of print. The World Wide Web (commonly referred to as 'The Web") is quite literally one of the most significant things to happen to computers. The Web has been called the herald of the new information age. It represents a totally new and expedient method of accessing information and data intuitively and graphically from anywhere in the world. The Web is the primary cause for the explosion in the Internet over the last two years. Data And Global Accessibility from the Internet were once reserved for the technical elite. Web software not only makes these resources available to a non-technical audience, but for the first time in history, any business or organization can market consumer goods and services on a scale once reserved for only the largest corporations; a totally level playing field has emerged in advertising, and it's called the World Wide Web! To Access And View Material On The Web, one only needs a computer with a modem and software made especially for viewing Internet resources graphically - commonly referred to as a web browser. Once you get access to the Internet - available through a local Internet Service Provider or from several commercial data services - you can use the browser software to find information on just about anything, anywhere in the world. The information is made available on the Internet by companies like CYBER CITY ONLINE Internet Web Services who can convert brochures, catalogs, magazines, and more into a format readily accessible by web browsers. Making this data available to the net is called hosting, and is one of the services offered by CYBER CITY ONLINE. Surfing The Web: One of the user-friendly aspects of web browsers is that the software runs on virtually any computer platform from Macs, to PCs, to Workstations. The other inherent feature of using web browsers is that you select data or information you want to see or read about by moving a mouse to a position on the screen indicated by what's called a hyperlink, - typically some text that is a different color and is underlined - and clicking. The hyperlink may be pointing to data available locally on the same computer you're on, or data located on the other side of the earth. It's basically transparent to you, and the data is generally returned so fast that you don't have much time to think about it. You may now see a number of hyperlinks on the "page" of new information you just retrieved and click one of them - and end up looking at information located somewhere else in the world. This hyper linking through various information & eventually not quite being sure where you are physically is what's referred to as "Surfing The Web". It also illustrates the magic of the Internet; all information that's been made available to the Internet is available everywhere on the net as a virtual (not physical) file cabinet. The physical location of the computers making the data available is transparent to the end user: the net becomes the resource. Ready To Have Millions See Information About Your Company's Products Or Services? CYBER CITY ONLINE provides all the support you need to get your messages seen and heard loud and clear all over town, or all over the globe. We have designed Web interfaces to reservation systems, chat areas, on-line focus groups, and have helped many companies sell their products directly through the Internet via on-line catalogs. We've put up magazines, brochures, audio clips, and much more. And we have references that will validate our record of success that we'll be happy to share with you. All it takes to get in front of millions of people is Contact CYBER CITY ONLINE. Connecting one Local Area Network (LAN) or Wide Area Network (WAN) to another Internet works the two, hence the origin of the work Internet. The Internet today is a vast global collection of networks that can share communications between any computing system on one of these networks with any other system on any other equally connected network. Simply think of your internal office LAN connected through a network cable to another office LAN across the street. The use of TCP/IP protocols by network members standardizes the communications ability of all these systems to "talk" with each other. Collectively this would describe an Internet in a very simple form. The term "Intranet" refers to sharing internal corporate data and information resources among other computer systems and their users in the same enterprise via the Internet. The historical alternative would be buying a series of leased data lines from the phone company that would connect each corporate network together into what is termed a "private network". Private Networks offer advantages in ownership and throughput, but are disadvantaged by the price of lines and hardware and by having to provide additional maintenance infrastructures. Since the Internet is a shared resource, many companies prefer using it as a "virtual private network" (or VPN) in place of a true private network to avoid overhead. In conjunction with specialized security methods such as encryption or firewalls, a VPN provides integrity and a robust environment at a low cost. An "intranet" is such a use. Access to the Internet can be via a "dedicated" (available 24x7) or "dial-up" (available as needed) line from your computer or network to another network generally accessed via an account with an Internet Service Provider (ISP). 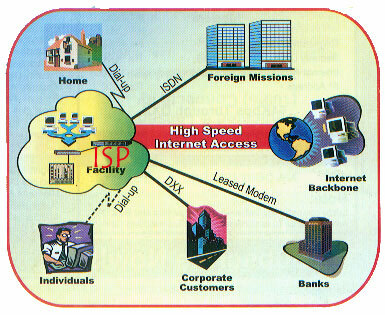 The ISP connects to other ISPs via a series of Internet "Backbones" that offer high speed network connections between them. In many cases, ISPs may have other businesses such as long distance phone services (like MCI). Serial Line Internet Protocol/Point-to-Point Protocol (SLIP/PPP) provide the handshaking agreements and temporary routing information when dialing your personal computer into the Internet via an ISP. Transmission Control Protocol/Internet Protocol (TCP/IP) provides the Internet "envelope" that carries data from one system to another system. Necessary address information to route the data is also carried by TCP/IP. "Bridges" link LANs with one another. "Gateways" are bridges that also translate data from various network environments into each others protocol thus allowing data to flow back and forth between the different nets. "Routers" help manage Internet traffic by pointing data from place to place based on network addresses in the TCP/IP data envelope. Think of routers as postal workers that forward mail to the address on the envelope. America On-line and other Commercial BBS Services provide proprietary data available only to subscribers. Subscribers may reach these services by dialing into private networks run by these services, or (in some cases) via the Internet. Dialing into a commercial service does not necessarily confer Internet access to the user. In many cases, Internet access is available as an add-on service, but may have less performance than standard SLIP/PPP accounts through ISPs. This is due to the overhead of the X.25 protocol used by many commercial services to connect the computers you dial into locally to the corporate offices of the service. The Internet is generally illustrated as a cloud to represent the vast array of networks that are joined together world wide. Systems and networks are always joining and leaving the Internet, but enough networks are consistently available to route data between connected systems just about anywhere in the world. The "Domain Name System" (DNS) on an Internet server translates an easy to remember name into an "IP address". For example, the domain name CYBERCITY-ONLINE.NET translates into the address Routers deliver mail, web, or other data to the requested addresses based on the DNS translations. A typical E-Mail address such as info@cybercity-online.net tells Internet routers to first locate "CYBERCITY-ONLINE.NET", then the mail server routes the mail to the user "info" at CYBERCITY-ONLINE.NET. E-Mail (and only E-Mail) addresses use an "@" sign. The speed of the connections between computers on the Internet is referred to as their bandwidth. A 14.4 Kbps modem transfers data half as fast as a 28.8 Kbps modem. (Kbps is shorthand for kilo(1024) bits bits per second). ISDN allows speeds at 64 Kbps or 128 Kbps. A T1 or T3 connection passes data at 1.54 Mbps and 45 Mbps respectively (where the "M" = Mega, or 1024000 bits). Newer Fiber Optic lines being installed today can pass data at 150 Mbps (an OC8 line), and at 600 Mbps (OC12), and even higher. Cable TV modems can also offer speeds many times faster than conventional computer modems, and while much cheaper than current dedicated bandwidth options, roll-out of these units is being hampered by poor performance of standard co-axial cable TV lines. Just like a phone line in your office can be used alternately for a telephone handset, a FAX, and a computer MODEM depending on what you need at any given moment, the Internet can be used for many things over the same wire. Several popular software "protocols" - simple handshaking agreements between like software - allow a user to send E-Mail, use the World Wide Web, transfer files, or log in remotely (to name a few services available through the Internet). The recent explosion of activity surrounding the Internet (which has doubled in size every year since 1982) is largely due to the World Wide Web software which had emerged by 1993. Not only can traditional forms of information such as articles and whole books be published on the web, but so can advertisements, product brochures, and complete catalogs with full color photos. And, by accessing programs that run off the server via sophisticated techniques using the Common Gateway Interface (CGI), orders for goods and services can be generated by a user in a web site. On-line reservation systems built into a web environment also offer a convenience that traditional media hasn't duplicated. "Pointing the browser" to this address (entering the address in the URL field) makes an Internet connection between the browser and web server. Hypertext Links similar to underlined phrases in windows-based help files allow the user to jump from one set of information to another - either in the same web site, or on a web server around the world - transparently. Hence the phrase "Surfing The Web". Web pages are created using Hypertext Markup Language (HTML) and need only to be made available to the Internet by a web server to get world-wide visibility. Since web browsers are available for virtually any computer platform, the need to recapitalize for added computer hardware to take advantage of the features of the web has completely disappeared. CGI gateways work with HTML to pass data out of and back to web pages. Web pages are written in combinations of Perl, C/C++, Java, SQL and other languages, many highly efficient web sites are created dynamically from database objects based on a set of rules met by the software at run-time. Increasingly, companies have been using the web to access so called back-office applications such as databases. With secure user authentication techniques to limit the target audience, data that was once locked in departmental data farms can now be securely accessed and shared across all levels of the organization including "external" sales and support personnel.